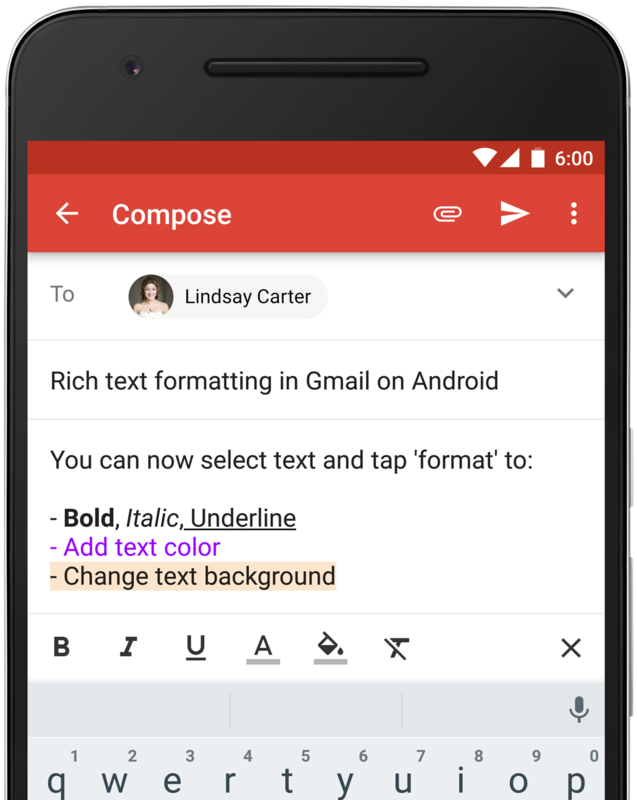 Monday, the 24th of July 2017 saw the introduction of two great amazing feature into the Gmail app for android devices. These feature are Rich Text Formatting and Instant RSVP. Matthew Izatt, the Product Manager who announce this feature via the Gmail Official blog says that these feature is intended to enable users have "amazing mobile experience" since more than two-thirds of all Gmail users check email with their phones. With the Rich Text Formatting feature, he explains, you can now "add bold, italic, underlined, colored and highlighted text to your email—all from inside the mobile app. These new options are great for making a point or emphasizing what’s important" while "If you use Google Calendar or Microsoft Exchange, calendar invitations now include a one-tap option to show your schedule and respond. No more opening up separate apps just to see if you can squeeze in a meeting" he added. Click >>> HERE <<< now to get the updated Gmail android app version comes with these exciting feature. 3 Way To Gain Control Over Your Gmail Inbox.